When particular expressions of a characteristic are naturally selected and those expressions are associated with particular gene variants, those gene variants will be more likely than others to be passed on to future generations. For example, let’s say that there exists a gene with two variants, T and t, and that these variants are associated with difference in the average height of plants from a particular (fictional) species, Pirasus arizonensis. From a baseline height of five inches, T increases the average height by 1/2 inch, whereas t decreases the average height by 1/2 inch. If P. arizonensis seeds are transported by birds into an environment in which the fully grown plant is surrounded by plants from another (fictional) species, Torensi mojavensis, that has an average height of six inches, the taller species will limit the smaller species’ access to sunlight. This, of course, would be detrimental to the survival and reproductive success of P. arizonensis. Thus, any P. arizonensis plant that grows taller than the average height of five inches will tend to survive longer and reproduce more. 100 tt plants, which will have an average height of four inches. As you can see, there are 276 plants with at least one copy of the T variant, which is much larger than the number of plants with at least one t variant (144 plants). Figure 1. Changes in the Frequencies of T and t Over Five Generations. As you can see, the frequency of T becomes almost 100% within five generations, which means that the population in this new environment now consists almost entirely of plants that are about six inches tall. Thus, over a very short period of time, natural selection can lead to a large change in the average expression of a characteristic in a population when individual differences in that characteristic are strongly associated with genetic differences. Now, let’s return to the example from the previous post: the founding population of fruit flies on a tiny and isolated island buffeted by strong winds. Differences in the size of fruit-fly wings are strongly linked to differences in genes (Robertson & Reeve, 1952), to a degree similar to that described above for height differences in the fictional plant species. 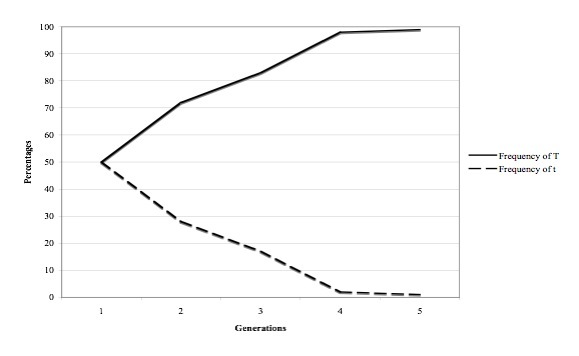 Thus, if the windy environment naturally select flies with smaller wings, gene variants correlated with smaller wings will increase in frequency over generations. This means that the population will evolve a smaller average wing size. 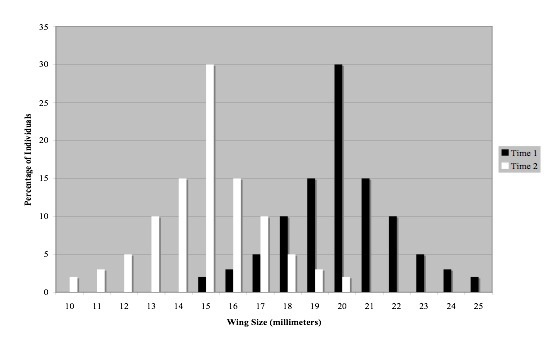 This is shown in Figure 2 (the black bars represent the founding population and the white bars represent the population after a number of generations of natural selection for smaller wing sizes). Although these two examples are fictional ones, there are many examples of natural selection and artificial selection (selection in which humans breed organisms that express particular characteristics). For introductions to and histories of the concepts of evolution and natural selection, see Colby (1996-1997), Endler (1986), and Zimmer (2001). Robertson, F. W., & Reeve, E. C. R. (1952). Studies in quantitative inheritance. I. The effects of selection for wing and thorax length in Drosophila melanogaster. Journal of Genetics, 50, 416-448.
Zimmer, C. (2001). Evolution: The triumph of an idea. New York: HarperCollins.